When you walk into the Grand Hyatt, you expect to be dazzled; the red carpet treatment, the wide brimmed wine glasses and smooth liqueurs, the incense scented air and the succulent hors’ d ’oeuvres. It’s very easy to get distracted by all the impeccably clad guests, the (somewhat) garishly clad media representatives and the abundance of celebrities, but we’re here to give you a clear cut review of the night (albeit aided by a drink or two but hey, it was an open bar!). The event (though it kicked off over an hour and a half late), was a success in several aspects. Familiar faces like Hard Kaur and Ayushman Khurana arrived in style and everybody was dressed to the nines. You could catch a glimpse of designer jump suits in silk, suave cut Mango semi formal jackets and a range of sky high heels that were clearly not made for walking . Seated at the white clad tables, the show opened with an interesting, if somewhat mediocre live show of sand art, in which the artist proceeded to draw a variety of human faces on loose sand spread across a back lit light screen. This was followed by a general introduction to the Colgate brand and a very dry slideshow on it’s history. However, things took a turn for the better and finally had us smiling when Clinton and Dominique took the stage and lifted everyone’s spirits by singing favourites like ‘Yeh Tumhari Meri Baatein’, ‘Kya Karoon’ and ‘Sooraj Ki Baahon Mein’. The music changed in a dramatic fashion once the duo left the stage and a symphony of lights arced across the room: the fashion show was beginning. Smoke rolled across the runway and the music reached an urgent crescendo as the first two models sashayed down the head ramp. The wait was completely worth it. The Manish Malhotra ‘Visible White’ collection was cutting edge. The collection was Indian with a slew of modern twists and turns that led us to a very interesting place. All the clothes were white with splashes of red, making for a very striking showing. Sheer, silk, cotton, Lucknowi work, chikan work, stripes and dazzling sequences floated down the ramp. Manish Malhotra has managed to elevate Indian haute couture to a new level with this collection. No piece looked gaudy, out of place or over done; every single outfit was gorgeous in it’s own right. Needless to say, the crowd went crazy when Sonam Kapoor walked the ramp in a beautiful red chaniya choli that, while being traditional, was anything but. 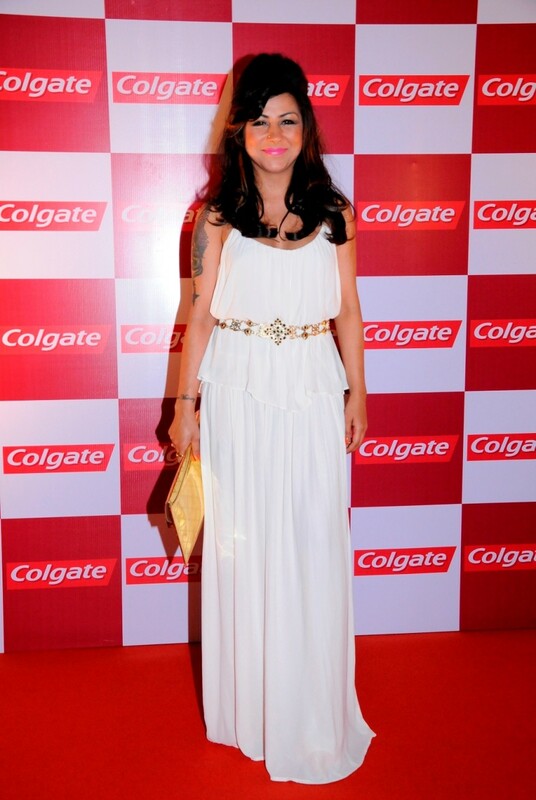 Colgate launched their new product, ‘Visible White’ (toothpaste), at the end of the show. The question and answer round that followed saw the most typical questions, with Manish explaining his idea for making cutting edge Indian wear for the urban youth (not that I know any ‘youth’ who can afford his clothes). He also said that he wanted to make a statement with the vibrant red he used in his collection as a burst of colour amid all the black that is trending in Europe this summer and spring. Sonam dazzling the crowd with her famous smile and talked about how she only believes in endorsing the things she herself uses. Our review, at the end of the night, reads thus: fashion shows will always be over rated to some extent and half way shallow but designers like Manish Malhotra make the wait worth while. Don’t forget to take a look at his new line and pack the dresses away for your wish list. You know you can trust it if you heard it here, at FashionMostWanted. Peace, while I nurse my hangover. wow, editorial, thanks for following my blog! I’m currently writing a post on another fashion item!! I’ll mention your blog to thank you following! ← Bidding Adieu In Style!